Recently, Lewis Michaelson, IAP2 USA Board member and former Vice President, participated in an online discussion on LinkedIn in response to the question: Do we make a distinction between consultation and participation in our understanding of stakeholder engagement practices? 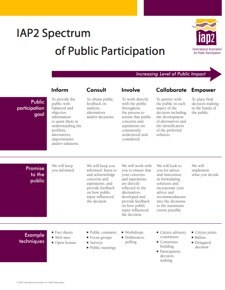 The discussion mentioned various typologies, hierarchies and models for describing the different forms of public participation, including the IAP2 Spectrum and Sherry Arnstein’s “Ladder of Citizen Participation.” Below is Lewis’s contribution to that discussion in which he describes what makes the IAP2 Spectrum unique as a public participation tool. First, an admission: I had a hand in the development of the IAP2 Spectrum of Public Participation (PDF), so I can tell you a bit about the intent. The desire to create the Spectrum came from just the kind of confusion that normally accompanied the original question of this discussion, i.e. what are the distinctions between the various terms used to describe public participation and are they important? The answer from the participants’ standpoint is yes, they are important! While each of the words used to describe the various levels on the IAP2 Spectrum of Public Participation have different connotations to different people and across different cultures (even before we translate them into other languages), what the IAP2 Spectrum implies is that different processes confer different levels of influence/impact on the decision being made. Consequently, it behooves all us not to just place a name on it, but to explicitly articulate what type of “return on investment” (ROI) participants can expect to receive if they choose to participate. The Spectrum is laid out horizontally instead of as a ladder, because each of the processes on the Spectrum has a legitimate purpose, depending on the decision to be made, the significance of potential impacts on stakeholders, and the amount of time I, as a stakeholder, may wish to commit. In that sense, the Spectrum is non-judgmental. If the decision to be made is one that I have a passing interest in, the impacts are nominal and I don’t want to spend a lot of time on the issue, I may be perfectly satisfied being consulted. For example, if my wife asks me what I’d like to have for dinner, I know she is not willing to make anything I could possibly dream of, and I don’t expect her to. I realize she is “consulting” with me, not empowering me to make the decision. I may say, “I had Mexican for lunch, so Italian would be nice.” But if I come home and she says “I ran out of time to make lasagna but I can whip up a quesadilla,” I’m not going to complain that I was misled or should have had more influence over the decision. After all, she was nice enough to make me dinner. I know it’s a crass example (and I also make dinner too), but the point is, different levels of participation and stakeholder influence may be appropriate given the individual circumstances of the decision, the intent of the decision maker and the desires of the stakeholders participating in the public participation process. What is crucial is for the stakeholder(s) to know is what is being offered in terms of participation, so that they can make a rational choice about whether it is worth their time to participate based on how much influence they can have on the decision (what I call ROI). If not satisfied, their other choice is to seek influence over the decision through other means. In the U.S., this usually takes the form of protest, suing in the courts and/or taking the issue to the media. Thus, the decision maker must do three things: 1. make it clear what type of process and influence over the decision is being offered; 2. consider the other alternatives stakeholders have to influence the decision when choosing the level of public participation; and 3, whichever level they eventually choose, deliver on that promise. That is why the IAP2 Spectrum makes it clear that different promises are being made and different expectations are being raised depending on how people interpret the term you use to name the process. Lest you think that the IAP2 is not concerned with ethics and power imbalances, I would recommend you look at two other tools that IAP2 offers, Core Values for the Practice of Public Participation and the IAP2 Code of Ethics for Public Participation Practitioners. The first addresses what we expect of processes that go by the name public participation and the second is what we expect of people engaged as practitioners of public participation. This, to me, represents one of the most significant contributions to democracy that I have seen: a concise, clear methodology for creating a meaningful and suitable role for the public in decisions affecting their lives. I would add that among the best lessons I have learned is that the spectrum can and should be shared with stakeholders even before a decision is made about which end (or ends) of the spectrum a process might use. The more the public can agree with decision-makers on how to participate, the more likely the public will participate in good faith and the higher their return on investment will likely be.